I was lucky to discover The Feldenkrais Method, which has become both a personal and professional practice. I have run a full-time practice since qualifying in 1990 (London). I always wanted to be a teacher and I trained as a schoolteacher when I left school. For years I taught in primary, secondary and adult education, eventually moving sideways to do a PhD researching young children’s understanding about communication. My early teacher training (in the now infamous late ‘60s) was illuminated by the ideals of self-motivated, self-driven education. In retrospect, my first weekend in the Feldenkrais Method made all that progressive theory live for me. I experienced that finding for yourself how to do something is a very different thing from being told how to do it; discovering a change is very different from being told what is different. At first The Feldenkrais Method® seemed completely incomprehensible – I had no intellectual understanding of what we’d been doing. But after the workshop, back at work, I realised that my response to the stress I was under at the time had changed completely – I was managing it much more efficiently. The whole experience resonated so strongly that I enrolled on the first training in England. At first, I did the training for my personal development. But soon I was compelled to practice and teach the work – it was completely involving and fascinating. Since qualifying I have worked full-time as a Feldenkrais practitioner and teacher. I offer the full range of Functional Integration and Awareness through Movement in Bath and Bristol and occasionally elsewhere, both public (open) groups and closed, specialist work. The daily interest of working with whoever comes is enriched by opportunities to work with specialist groups such as musicians, physical theatre performers and dressage riders. 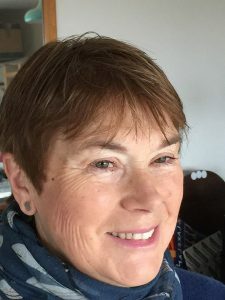 I am qualified as an Assistant Trainer and currently work on the Professional Feldenkrais Trainings in London and Barcelona, teaching aspiring Feldenkrais Practitioners. My work is underpinned by my Qigong practice, having worked with Master Zhixing Wang over a period of 15 years.